An eerie horror/sci-fi that works even better today: great set design (by the director William Cameron Menzies), script, haunting music, and unforgettable images: the hill-top “sinking sand” set, weird marks on victims’ necks, the catacombed alien lair, the tall, green, bug-eyed Martians, the gold-like, tentacled, expressive “head”-intelligence in the globe, the LONG hypodermic needle, much more. Costumes work well too, note the change of the mother (Hillary Brooke) from loose-haired blonde sweetness, to a possessed rigid-hairstyled villainess in black. The doctor-heroine (Helena Carter) is a picture-book beauty of auburn-coiffured refinement and soft-spoken sympathy, clad in a cream-colored dress, with a bright red handkerchief to set it off and two-toned stilettos. Jimmy Hunt is all-American red-headed freckleness, unusual in that the story is told from his point-of-view, a fine performance. Good support from Morris Ankrum, Arthur Franz, and Leif Erickson. The dreamlike nature of the picture is only enhanced by the repeating footage, lots of stock military scenes, the wobbly aliens, etc. 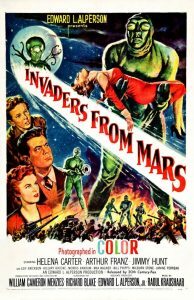 Basic plot was re-used for “It Came From Outer Space” (1953), “Invasion of the Body Snatchers” (1956), “It Conquered the World” (1956), many more. Skip the abysmal 1986 remake.